A consummate singer, Fay Victor, demonstrates that it is her right and ability to improvise freely, and in so doing she creates a potent connection with her band and her listeners. Singer Fay Victor is the solution to so many "What is the role of the singer in jazz today?" puzzles. The role, Victor proves throughout Wet Robots, is anything at all, anything the imagination allows. Victor has been singing pretty and singing wild, singing standards and improvising with the heavyweights for years in both Europe and New York, and she has been recently featured on William Parker's astonishing box set of vocal music as well as on the last recording by inside-out trombonist Roswell Rudd and the latest from flutist Nicole Mitchell. Wet Robots, however, is her date with a hand-picked band of peers, and it will blow your ears clear out of the water. The band is unconventional, no "mere" rhythm section for a singer's accompaniment. Victor has Reggie Nicholson on drums, along with soprano saxophonist Same Newsome and guitarist Joe Morris. No bass player is there to lock down the harmonies, and it certainly doesn't matter. What this band does is improvise melodically and tonally, developing its structures—and harmonies that seem right in the moment—along the way. Most of the singing here is without lyrics, placing the leader in the position of being, you might think, another horn player on the front line. But that reductive description isn't fair to Victor and the creative arsenal she brings to the project. She operates truly as a singer, taking advantage of her ability not only to articulate pitches and rhythms but also to vary her sonority and attack with awesome flexibility. That is not to say that she shouts or screams (though at times she does, with extreme control) but rather than she gnarls her voice into seemingly infinite shades and timbres. She squeezes it; she opens it up. She growls and whispers. She adds varying degrees of nasal tone or vibrato. She becomes more or less breathy, more or less piercing, more or less lush. On the first two improvisations, "Funky Dunk" and "A Witness in the Wilderness", Victor rips through a quick-changing array of those options, all the while listening to what her bandmates are doing to dare, feed, or support her. But to get a sense of her utter control and compositional awareness, listen to the opening of "Wilderness", which opens with just voice and drums, with Victor beginning with a jagged line sung in a fluttering style that then alternates with a peaceful held note that is so tender and soft that it sounds like a flute. Nothing about this song is unintentional or out of control, though listeners will be pleasantly surprised throughout. As you might imagine, Newsome's soprano often sounds like another voice, and his tonal variations are almost as varied as Victor's. Morris has the ability to play lines and chords, to pick and strum, as well as to use varying tones or distortions. On "Wilderness", for example, all we hear of Newsome is a piercing whistling as he pushes air past his reed in a tight clench. Morris, there, is tender and quiet, rippling around the singing. On "Funky Dunk", by contrast, Morris and Newsome both play wildly melodic lines that use traditional tone and largely consonant harmonies, though the tonal center is constantly shifting. As a singer, Victor also has lyrics at her disposal. "Information Highway" begins with a recitation—a spoken warning about the change of the digital age. But Victor is able to transition from this speech-like mode into all manner or scatting, intoning, and pitched singing. Partly because every tone she utters is musical, even if it isn't "singing" On this tune Morris begins sounding like an acoustic bass, and he throbs rhythmically, filling whatever space needs filling. "Creative Folks!" is more of a groover, with Nicholson playing a rattling free jazz polyrhythm and Morris locking into a funky chordal pattern for long sections. Victor sings about the meaning of being creative ("Creating is connection") as Newsome winds around her vocal like a mad harmonica player, bending notes and staying close to the blues heart of the song. At the end, the song winds down toward silence ("Remember, we are the last revolutionaries") as each band member slows and lowers the heat until Victor ends with an emphatic "Creative folks!" 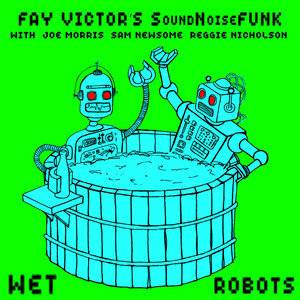 As I listened to the bulk of Wet Robots, the freely improvised parts, I wondered why I felt I was holding the music to a higher standard than purely instrumental "free jazz". When instrumentalists jam without chord changes or a pre-determined melody, I easily accept the freedom as a kind of natural daring. With a singer as part of the band, a more conservative side of my personality was asking tougher questions: Is Victor choosing her notes with care? Is she just making a bunch of crazy sounds? These questions were unfair, but I was thinking about them. And then, listening to "Police Lights and Sirens" I came upon moment after moment in which Victor curled her singing—most certainly freely expressive—into beautiful harmony with Newsome's soprano or into arpeggiated dialog with Morris' guitar. I heard how she drew on elements of straight blues singing but then turned them back to a different purpose. The truth is: Victor has every right to sing freely improvised music. And, to the same extent as her instrumentalists, she has the chops, discipline, and imagination to make it beautiful. The marvel of it all is how the tunes differentiate themselves in tone and attack. "The Blues Are Always Free" finds Victor singing percussive/breathy figures, alternating with more nasal glissandi—techniques that could remind a listener or two of what pop singer Al Jarreau used to do in the 1970s. "Textured Pines" presents Newsome and Victor as nearly indistinguishable partners, creating clicks, swipes, squeezed streams, and bending squeals—with Morris eventually stealing the tune with his melodicism, only to have Victor join him at the end in a delightful scatting performance that evokes, yes, Ella Fitzgerald. A bit. "Squeeze Bottle" lets Victor sing in a percussively syncopated way, lurching across intervals as Newsome plays with more legato beauty. Listen and marvel at the variety of enchantments. The third set of lyrics is the most moving and powerful performance on Wet Robots. "I sing," Victor begins, "I sing to be alive / I sing to connect to myself / Express feelings that I don't know I have / The dark, the mystic, the sage, the little girl / The fear possessed deep in cells that creep out when I sing." This meditation on what singing means or can mean is set against a soprano saxophone line by Newsome that is breathtakingly lyrical. Nicholson accompanies with sensitive brushwork, and Morris eventually joins Newsome in a natural duet. Victor, leaving lyrics behind, seems to become a buzzing, Harmon-muted trumpet, a third line of counterpoint. On this performance, Victor seems to do everything she can within a more traditional approach, yet it is still done with a paramount degree of expressive freedom. On a third or fourth pass through this remarkable document—and what can only be called a narrowly focused part of Fay Victor's art, as she has fronted many bands with many different instrumentations and approaches—I felt I needed to rethink what "jazz" singing really could or ought to be so many years after talents like Betty Carter, Nina Simone, and Cassandra Wilson had dared to begin redefining it. Victor is at another level of freedom and daring and creativity. Sure, this kind of music is at the arty margin, but Victor proves that this kind of abstract singing is also flesh and blood and heart and earth. "I sing to save my life / I sing to look human", Fay Victor makes clear.